Ashish Kawale from Pune, Other Graduate. ADOBE PHOTOSHOP COREL DRAW ILLUSTRATOR IN-DESIGN ADOBE PREMIERE PRO .. FLASH (BASIC) HTML (BASIC) ADOBE AFTER EFFECTS .. VIDEOPAD OPENSHOT COREL VIDEOSTUDIO P.. ADOBE PHOTOSHOP COREL DRAW ILLUSTRATOR IN-DESIGN ADOBE PREMIERE PRO .. FLASH (BASIC) HTML (BASIC) ADOBE AFTER EFFECTS .. VIDEOPAD OPENSHOT COREL VIDEOSTUDIO P..
are one of expert skill area's of Ashish Kawale . 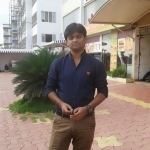 Ashish Kawale is working in Others industry.